Pour les petites faims de fin de nuit (le stand ferme à 4h juste avant que Paris ne s’éveille). Un oubli impardonnable enfin réparé ! First selection since two years. 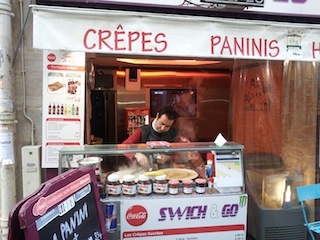 Between Hôtel de Ville and Centre Pompidou, they do good pancakes with a french smile. Rue de la Verrerie (pedestrian zone), just before “Au verre luisant” café. Between Châtelet Les Halles and the BHV, ideal for a little break between ? A very good bargain, place side by side to a pub, in the pure tradition. A good idea, for a little hunger at the end of the evening. In Roquette Street, stand on the pavement, on the left when coming from the place. Your friend is one more time late at your meeting point. Wait with a little pancake ! The stand is in the middle of the place. The best pancakes of Paris, may be… ? bigger… for sure !! Eat a nice pancake opposite the Eiffel tower, not bad, isn’t it? Just at the bottom of the stairs, before reaching the “Seine”. At the corner of the Saint Denis Street and the Lombards Street. A lot of competition in this field, but our favourite goes to this one, the pancake is its main speciality. At the corner of the Saint-André des Arts street, outdoor stand open all the year. Vous vous trouvez dans les archives de la catégorie La sélection.